A high quality, functioning heating system is an investment in your home that you should take seriously. 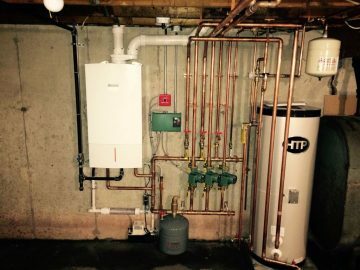 When temperatures drop on Maine winter nights, it is crucial to have a heating system that is working correctly and efficiently. No one expects their furnace to shut down in the middle of a cold winter night, but you don’t need to be caught off-guard. If you do run into a problem, it’s important to have a reputable heating expert you can call. Ask yourself when the last time you had a trained HVAC technician check on your furnace was. If the answer is a year or longer, you’re due for annual maintenance. Any fluid leaking from your heating system is an indicator of a potentially serious issue and needs to be addressed quickly if you want your house to stay warm. A weird noise is one of the clearest red flags that your furnace needs to be repaired. No matter the noise coming from your heating system – if it is out of the ordinary, something is amiss. A trained technician should diagnose it and determine what it is—these noises won’t go away on their own. Have you driven a car with a busted heater? Then you know that air can quickly go from flowing freely to barely coming out of the vents at all. This can also become a problem with your furnace. This can be either a major or minor issue to repair, but the bottom line is you need an HVAC technician to take a look and spot the places in need of repair. A thermostat that becomes ineffective—meaning you have to turn it higher and higher to heat your home even a little bit—is a definite sign that either your thermostat or your heating system needs repair. A heating bill that goes up, way up, without a corresponding bump in use, is another strong indicator your system needs repair. There are a few things that can be wrong and it’s often difficult to figure out the culprit. We have the equipment and expertise to find the problem, then advise you on next steps. If your furnace has started blowing cold air instead of hot, that is a clear sign of an issue. This can be caused by several issues and should be diagnosed by a technician quickly to get your system back up and running as soon as possible. If you hear your furnace or boiler kicking on and off repeatedly, this likely indicates that it’s short cycling, which means it’s running more often than it should. That’s a problem that may be caused by several things, so as we’ve seen with a few of the other items above, it’s best to call a professional for repairs when the cause is tough to pin down. Is your furnace old enough to be in college? If the answer is yes, it likely has some potential problem areas. The average lifespan of a furnace is about 20 years – with some not making it to 20 and others far outlasting that number. In many cases, being diligent about maintenance and repairs can make the difference.